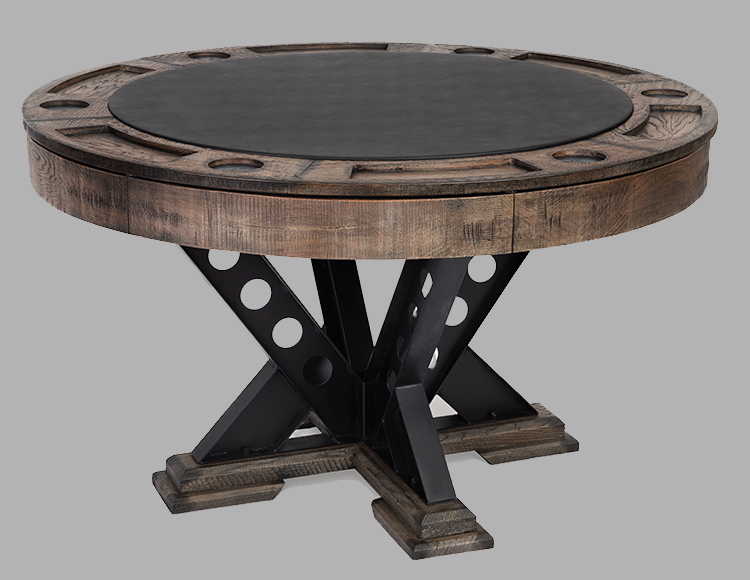 The Brunswick Heritage Game Table can add casual elegance to your game room. This solid wood table, with Chestnut or Espresso finish veneers, features a man-made spill resistant playing surface, generous chip holders, deep beverage coasters, and an under-table storage area for gaming accessories. When not in use for gaming, just turn the top over for additional dining space. Chairs sold separately. 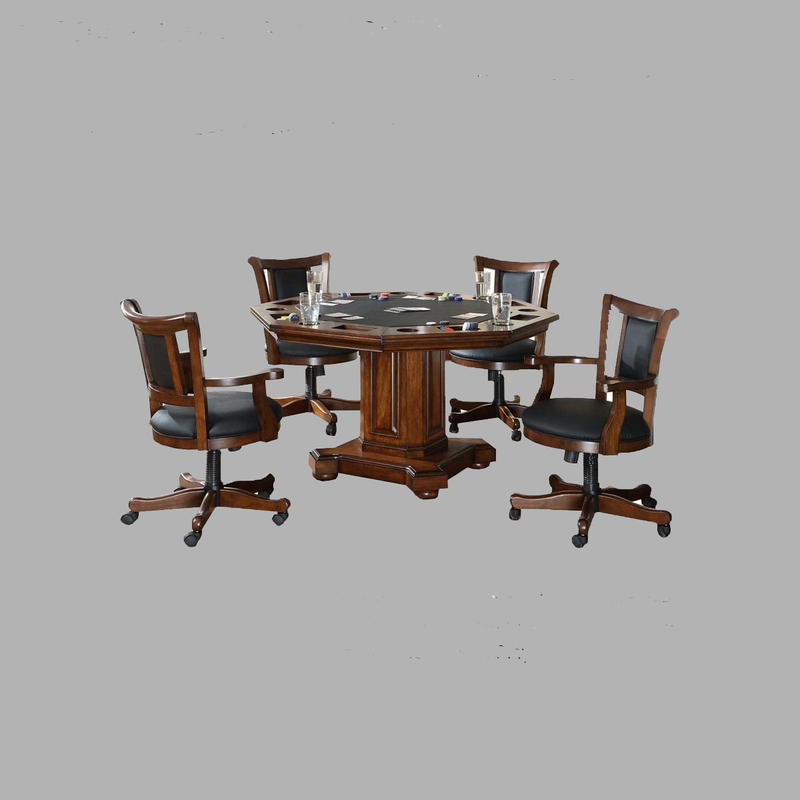 The Presidential Octagonal 2-in-1 Poker Table Set with 4 Chairs is 48" and comes with a dining top making it the perfect addition to any room. This table is also available for purchase without the chairs. It comes in your choice of chestnut, mahogany or espresso finish. The Brunswick Centennial Game Table can add casual elegance to your game room. This solid wood table, with Chestnut or Espresso finish veneers, features a man-made spill resistant playing surface, generous chip holders, deep beverage coasters, and an under-table storage area for gaming accessories. When not in use for gaming, just turn the top over for additional dining space. Chairs sold separately. 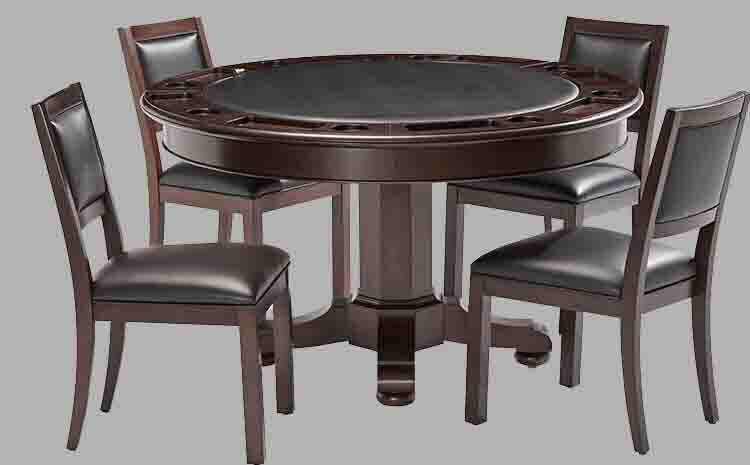 The Presidential Vienna is a gorgeous round Poker/Dining table. With its exquisite Silvered Oak Finish and Unique Metal Base it is sure to compliment Any Room. The Game Chair is available and sold seperately. Paired with The Vienna Pool Table and Vienna Shuffleboard you're certain to have an extraordinary Game Room. The Imperial 2 in 1 Game Table with 4 chair set allows you to get the most out of your game room space. Made of solid Birch Wood in a Distressed Walnut Finish this octogonal table features a 52" top that instantly converts from a dining table to an 8-position poker table. The poker top features a felt playing surface, chip holders and cup holders while the chairs are gas tilt and swivel. 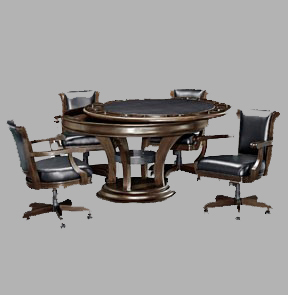 The Presidential Hamilton Poker/Dining Table comes in an Espresso Finish. It is designed to complete the Hamilton Collection, but this table stands out all on its own. Available on its own or as a set complete with 4 game chairs. The Presidential Tyler Poker/Dining Table comes in the same Rustic Oak finish as the rest of the Tyler Collection. This beauty is available on its own or as a complete set with 4 game chairs.